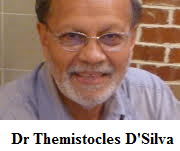 Dr Themistocles D’Silva has a long list of credentials. An alumnus of St Xavier’s College, Mumbai, Dr D’Silva has a doctorate in organic chemistry and has worked as a research scientist in the United States. There are 70 American patents and numerous scientific publications that stand as evidence to his academic prowess. A Fellow of the Royal Society of Chemistry, Dr D’Silva, has written about the Bhopal Gas Tragedy and given objective insight into it by disclosing little known facts about the actual cause of the gas leak. The book is called The Black Box of Bhopal: A Closer Look at the World's Deadliest Industrial Disaster. His recently released book Unravelling History, is a revised edition of a previously written book Beyond the Beach: The Village of Arossim, Goa, in Historical Perspective. Environment Minister Alina Saldanha went on to praise Dr D’Silva for the vital role he played during the Anti Meta Strips agitation by supplying information about the deleterious effects of the project. Unravelling History begins with a quote from Confucius: ‘Study the past if you would divine the future’, thus the study of history gives us a better perspective of the future. It contains new information researched by Dr D’Silva over the last five years in addition to material from the earlier book. Some of this new information includes archival data about the orfãns del rei or the orphans of the king, which makes for interesting reading. The foundation of his research was laid by the material collected by his father and uncle and was present in the family archives and an old map that he found in a book called Goa, Rainha do Oriente or Goa, Queen of the Orient, that showed that the Chapel of St Lawerence, Arrosim, and the Church of St Thomas, Cansaulim, existed in 1610. ‘That got me excited. If the map says they existed in 1610 then the church and chapel must be older than that,’ says Dr D’Silva. Dr D’Silva set about studying the geographical boundaries of the village and got to known the various landmarks and religious institutions. He got himself acquainted with the genealogies recorded in the family archives and perused church records. He spoke to the local people, especially the farmers, who he assures have a wealth of knowledge to offer. Dr D’Silva clarifies the confusion about the date when the Church of St Thomas was built. Fr Francisco de Sousa wrote in O Oriente Conquistado that the church was built in 1581, but Dr A B Bragança Pereira obtained his information from Fr Sebastião Gonçalves SJ and opined that the date could possibly be 1588. This, however, is not correct as Fr Sebastião Gonçalves had only mentioned that the Church of St Thomas was constructed in the same period as the Church of the Mother of God in Majorda in 1588. Fr Thomas Stephens, SJ, in a letter to his Superior General in Rome says three churches were built in 1581 without mentioning their names. Evidence shows that these churches were St Thomas (Cansaulim), St John the Baptist (Colva) and Our Saviour (Loutolim); the same churches that Fr Francisco de Sousa says were founded in 1581, in his book O Oriente Conquistado. Fr Sande wrote in the same year, two months after Fr Stephens, that three new churches have been built one each in Cansaulim, Colva and Loutolim. He says that the residence for the priests was not completed till 1587. This proves that the church could not have been built in 1588 and that 1581 should be considered the date of the construction of the Church of St Thomas. He gives the reason why the Three Kings feast is celebrated only in Cansaulim, Cuelim and Arrosim, and not Velsao. There are humorous tales told such as that Velsao used a buffalo in place of a horse and it went into a pond instead of going up the hill. However, the true reason is quite mundane. When the Velsao church was built, it was separated from the parish which included the other three villages. 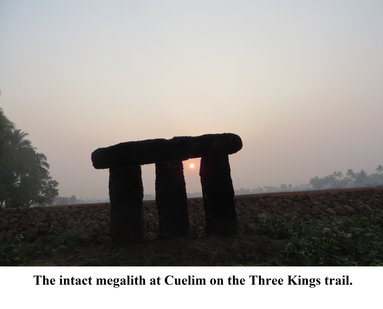 The observation of the Three Kings feast trail, particularly at Cuelim, brought certain things to Dr D’Silva’s notice. He saw that the flag man leading the King on the horse, the parasol carrier and others, would stop at the four megaliths or Dovornim as called by the local farmers, and wave the flags in homage. Earlier they would also pour feni over the stones. José Maria Soares from Cuelim claims that his clan has possessed the inherited right to participate in the trail as drum beaters, parasol carriers, etc, which goes back to very early times. Talking about prehistory, Dr D’Silva says stone hand axes have been found in Goa, which obviously brought in a revolution changing the lifestyle of men from nomadic to agricultural. Megaliths, carvings of Mother Goddess and the petroglyphs along the river bed of Usgalimal point to the presence of Neolithic people. The Dolmens (Dovornim or Dohannem) have 3-5 supports and one capstone. They may have served as resting places in the vicinity of reservoirs of water. These sort of structures have been found the world over and are seen as markers of grave sites. The tribals of Goa believe they were built by superhumans. 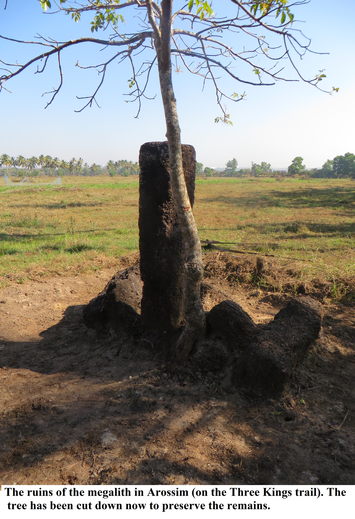 There are many megaliths around Arrosim, Cuelim and Cansaulim according to Dr D’Silva, because, ‘The location had a great significance to the first farmers (Neolithic people). There were many springs flowing out from the hills of Cuelim, Nagoa, Verna and even as far south as Nuvem, which form the tributaries and the beginnings of River Sal. And the rich soil for growing crops and the availability of other necessities of life, like, fish and shell fish, fruits, etc,’ says Dr D’Silva.